I had had the time of my life with the coast guard. We had played out West with the Big John Strong, the Rudy Bros., and the Tom Packs circuses. Now headed back East for an upcoming engagement at Radio City, we were holed up in a campground in Biloxi, waiting for the big New Orleans Shrine Circus to kick off. A layover of a week or more was not unusual for top circus acts in those days. The producers often brought in big acts to punch up the show for major dates. We were hired guns and only came in for the big ones. We hopscotched from show to show. Every night after dinner, my parents would dress to the nines, tell us to behave, and left us to watch over the Airstream while they went out. I’d crack a book, my brother would watch the tube, and I’d be out by the time they came in. Invariably, they would return quite late, and quite hammered. They were going every night to a nightclub where a friend of theirs was performing. I wasn’t paying a lot of attention to all this, as I was deep in a book about Johnny and Walter Yong, with whom I had recently worked a full season on the Hubert Castle Circus. I didn’t think it unusual that books were being written about my friends. It seemed normal. As the days went by, and the pattern remained the same, I picked up some info from eavesdropping on my parent’s conversations. It developed that their friend, Jayne, was having trouble with her club act, which was something new for her. She had asked my Mom and Dad to help her come up with some business to flesh it out. My Dad was telling my Mom that it wouldn’t take a whole lot to fix it. The audience seemed to love Jayne. My Mom commented with some surprise that Jayne could carry a tune quite well, and that some of her stuff was dynamite. Mom said she was glad Jayne was getting her life together, what with all those kids. My parents cared about Jayne and her kids. They were glad she and Mickey were getting back together. appearance. 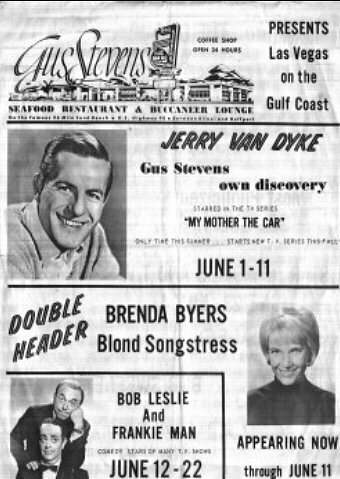 This is front page showing Jerry Van Dyke. Mickey had been a friend of my dad’s, both were expatriated Hungarians, both were acrobats, they had trained at the same gym in Hungary. Mickey had gone on to become Mr. Universe. My Dad was still chasing the Circus. Mickey was on his way from California, he and Jayne were getting back together. The papers made the most of it, my Mom would quietly cry, for no reason, in the dressing room between acts, for quite a few years after this. It was years later that I saw Jayne’s films, and realized that movie stars are Showpeople too. This program was signed by JM "
with her family in LA. “Coast Guard” Show lingo for a west coast show. “Hopscotch”… jumping from show to show, not moving with the same outfit, coming in for the big ones. The original Chinese Acrobats… who incidentally, were German.